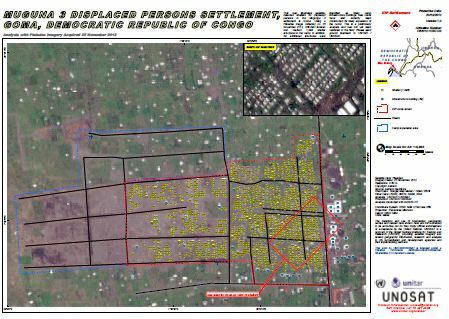 This map illustrates satellite detected shelters for displaced persons in the Mugunga 3 settlement in Goma. Using a Pleiades image collected on 25 November 2012, UNOSAT located and marked 1,098 shelter structures in the camp. In addition, 39 additional structures were identified as likely camp infrastructure buildings. New roads have also recently been constructed for likely expansion of the camp. This is a preliminary analysis and has not yet been validated in the field. Please send ground feedback to UNITAR /UNOSAT.